LABOR Volume 26 No.11 October, 1963 Racial Injustice in Iowa. Despite the pathetic picture of Cook's point life, thus demonstrated, there was widespread reaction against the St. Ambrose researchers. Some, embarrassed at the contrast twixt their own comfortable existence and that of their Mexican brothers, complained about imprudence, the injudiciousness of the revelations. Others noted that the Mexicans could better their position were they not shiftless, ignorant and lazy. Still others that the real truth was that many of the Mexicans owned other homes than their residences and rented same. One of the facts which of necessity caught out attention at the time was the fact that financially these families could not be classed at the very base of the income ladder. We understood that jobs had become available to these Mexicans during the War years, after which unemployment did not immediately become the problem that Henry Wallace and others anticipated. Moreover there was, surprisingly enough, representation of Mexican workers among the skilled and unskilled workers. The average income of these families amounted to $3,033. At the same time there were 12,890,000 families getting less than $3,000.00 per year in the United States. The Bureau of Labor Statistics gave the figure $3,248.00 as the minimum annual family wage for decency level living. There were at that time 9,600,000 families in cities receiving less than $2000.00 per year, There were 32 million persons, including one fifth of the Country's children, in these families. These consumed 20 percent less milk,fruit and vegetables ; 15 percent less eggs, fruit, poultry an fish than people in the above $2000.00 income bracket. Note that we include all families over $2,000.00. 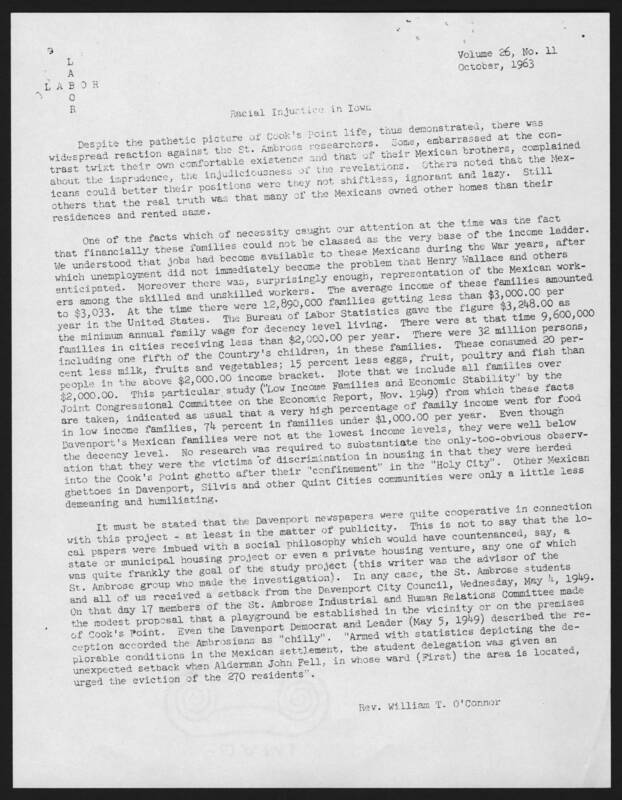 This particular study ("Low Income Families and Economic Stability" by the Joint Congressional Committee on the Economic Report, Nov 1949) from which these facts are taken, indicated as usual that a very high percentage of family income went for food in low income families, 74 percent in families under $1000.00 per year. Even though Davenport's Mexican families were not at the lowest income levels, they were well below the decency level. No research was required to substantiate the only-too-obvious observation that they were the victims of discrimination in housing in that they were herded into Cook's Point ghetto after their "confinement" in the "Holy City". Other Mexican ghettoes in Davenport, Silvis and other Quint Cities communities were only a little less demeaning and humiliating. It must be stated that the Davenport newspapers were quite cooperative in connection with this project - at least in the matter of publicity. This is not to say that the local papers were imbued with a social philosophy which would have countenanced, say a state or municipal housing project or even a private housing venture, any one of which was quite frankly the goal of the study project (this writer was the advisor of the St. Ambrose group who made the investigation.) In any case, the St. Ambrose students and all of us received a setback from the Davenport City Council, Wednesday, May 4, 1949. On that day 17 members of the St. Ambrose Industrial and Human Relations Committee made the modest proposal that a playground be established in the vicinity or on the premises of Cook's Point. Even the Davenport Democrat and Leader ( May 5,1949) described the reception accorded the Ambrosians as "chilly". " Armed with statistics depicting the deplorable conditions in the Mexican settlement, the student delegation was given an unexpected setback when Alderman John Fell, in whose ward (First) the area is located, urged the eviction of the 270 residents". Rev. William T. O'Connor.